I have started and erased this post at least 3 times without being able to fully explain myself on what is it that I want to share. It is the fact the during the past month I feel totally alienated to things that would interest me. Its summer and, as fellow geek ErazerheadX has as a comment in his gtalk account, "Normal services would be resumed after summer". It is this time of year that reading slashdot comments seems boring, checking for new gadgets seems insignificant and expressing opinions other than cocktail recipes seems out of place. 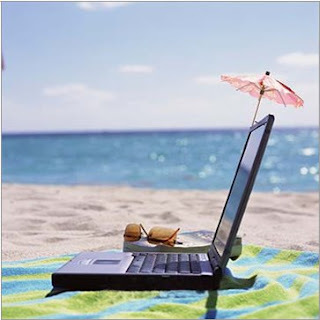 Essentially summer kills blogging. What's the point of spending that much time after work infront of a screen when you can be on the beach. Lifting fingers is hard work these days. Relaxing on the balcony with a home-made cocktail seems more important. Summer geek activities include the usual but, other than, the absolute essentials, is thrown out. The activities can be spiced up as well. Why read a graphic novel on the couch when you can read on the beach. There seems to be less time for gaming 'cause during weekends I am in no mood to stay at home and play(even though a couple of weekends back I did just that after a long time and i really enjoyed it). I am still hooked though. I can not get over my email addiction. I was away for, a few days, vacation and I was still checking my emails through my mobile. The last day though the addiction started to fade out and I checked my email only once!